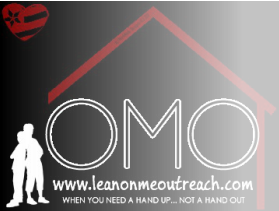 Lean on Me Outreach, LOMO, believes that people should be able to find the help they need. (LOMO) is dedicated to helping people move from unwanted homelessness to suitable, affordable and independent housing. The vision of LOMO is to permanently reduce the number of homeless in our community by providing resources for housing and employment searches. LOMO believes that people in need should not be made to feel ashamed of their situation, but that they should be able to find the help that they need. We aim to give people a hand up, not a handout. Many people believe homelessness is an impenetrable problem; some communities have helped by building shelters and other programs, such as transitional housing, soup kitchens and emergency shelter. While these programs are very helpful, they have not been very successful to those in and out of homelessness (chronically homeless). The vision of Lean On Me Outreach is to permanently reduce the number of homelessness in our communities, by bridging the gaps that other organizations may not be able to fill, by giving a hand up and not a hand out. We have found that most people just need temporary help when a life altering situation has come about in their life. Our goal is get people back on their feet and on the road to an independent lifestyle. Download our Android App and stay connected or like us on Facebook. Stay up to date with Lean On Me Outreach through our new Android App. Scan the Qr Bar Code with your Android Device and stay connected.